You’ve probably met other long-haul truck drivers who claim to be able to complete their trips without a drop of caffeine, and it’s hard to believe that’s true. After all, nothing really wakes you up in the morning like a nice big cup of coffee. In fact, there’s a whole ad campaign by a coffee brand that’s based around that fact alone. 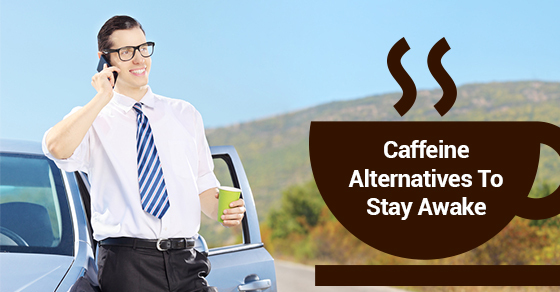 It may be hard to believe, but it’s more than just possible to make a long-haul trip without drinking coffee, energy drinks, soda, or other sources of caffeine. It’s doable for everyone! Not only is preventing dehydration good for your body in general, drinking water gives you something to do and keeps your mind active. Another part of drinking lots of water means frequent trips to the bathroom, adding to the list of activities you’ll be doing while on the road. Some cultures have been using this method for centuries as a natural alarm clock since it’s hard for your body to relax past a certain point when you’ve had so much water! It also helps since most North Americans suffer from at least mild degrees of dehydration as most people don’t consume water unless it’s in the form of coffee or alcohol. Also, make sure that you’re getting enough fresh air while you’re in the cabin. It’s true that in damp conditions, in order to keep your windows from fogging up, you’ll need to circulate the air inside, but it’s good to crack open the window once in awhile, or better yet, head out for a brisk walk. It’s hard to fall asleep mid-bite unless you’re seriously sleep deprived so consider using food to help you stay up. Of course, it would be a bad idea to snack on the food that you’d be able to buy while on the road so you’ll have to plan ahead. Buy, prep, and pack fresh vegetables cut into finger-sized servings for convenient eating. The good thing about snacking throughout the day is that you’re promoting an even metabolism as opposed to the usual 3 meals a day which causes spikes and dips in your body.